The Android OS on Z5 Premium runs on 1080p resolution, upscaled to 4K. The native high res mode is available only when viewing images and video - including YouTube. Games and VR apps didn't only started in 1080p resolution. As far as the Xperia launcher goes, Sony has gone to great lengths to preserve its signature look and feel over the years. This even extends to the bundled applications. Most of them are also practically untouched as far as navigation and UX goes, but now employ all the extra visual eye-candy of Android Lollipop. The lockscreen is very simple - it can display some notifications and support quick shortcuts for the camera and the dialer. That's it - no widgets or multiple panes are available. You can protect your lockscreen by Face, Pattern, PIN or Password unlock and in the Z5 Premium even fingerprint, in ascending order of security. The homescreens are business as usual - there are five of them and you can have up to seven. You can place widgets, app shortcuts, toggles and folders by your choosing. The notification area uses the standard Lollipop-style pull-down effect with multiple levels. Customizable quick settings are on the top and notifications on the bottom. The aforementioned can be accessed by swiping from the top twice, but Sony has also preserved its two-finger swipe gesture, which extends the full shade in one stroke. The app drawer is laid out across multiple pages and you can sort the apps in various ways. However, in this new version of the launcher the signature left swipe-out menu is gone. Instead it is replaced by a small drop-down menu on the right and the search bar is at the top. The Xperia Z5 Premium uses the stock Android task manager that lets you switch between the recently opened apps, as well as terminate any of them with a side-swipe. Close all key is available. 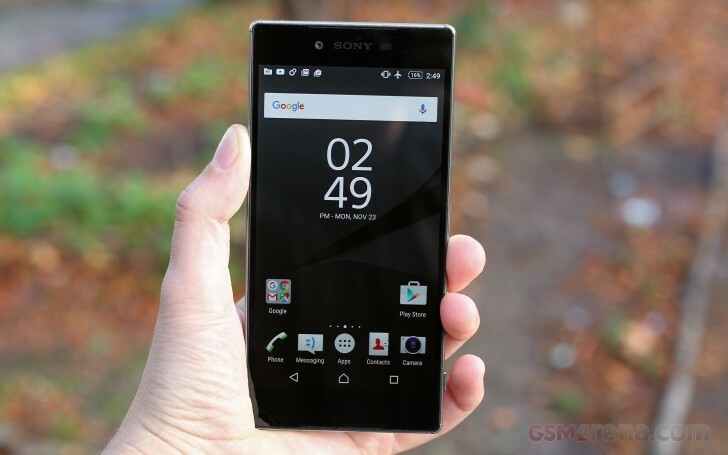 The so-called "small apps" are also available in the Xperia Z5 Premium and are accessible via the task manager. They are similar to Samsung's Mini Apps, and pop up tiny widget-like applications on your homescreen, which you can move around and use without having to open the full-fledged app. The list of small apps really tends to differ from one Sony to another for some reason and on our unit we found a default set of nine of those available: Active Clip, Browser, Calculator, Calendar, Timer, Touch Block, Music, Bookmarks, Gmail. Sadly, you can't disable the small apps entirely and will always have them cramming your recent apps whether you use them or not.